A newcomer to Melbourne, I love exploring the city and sourrounds by day and night, finding bargains, learning new things, the great outdoors and Melbourne life in general. Central Gardens offers everything you could wish for in a park. Officially opened in 1900, this is a Hawthorn oasis. You will find flower gardens, BBQs, pathways, lawn bowls, public toilets, shady trees, and a kids' playground with some very novel apparatus including a rocket. 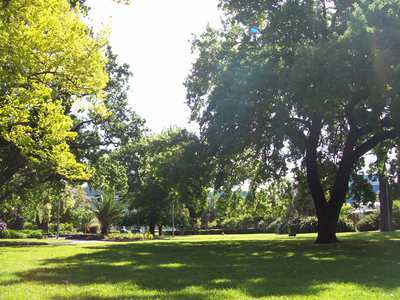 Situated next to Swinburne Uni, its perfect for a weekend stroll or laze in the sun. If you want to take a break from shopping or the hustle and bustle of Glenferrie Road, there is nowhere better. You'll find a mix of people enjoying the surroundings; families, dog walkers, students and couples, and it's more than large enough to find a quiet spot for yourself. There are no food outlets in the Central Gardens but there are some cheap cafes and a shop nearby on Swinburne Campus. Otherwise, bring a picnic or BBQ food and you're all set.